To start a new campaign, click the Add Campaign button in the top navigation menu. There are four steps to adding new campaigns: Network & Targeting, Links, Fire & Forget and Ads. The first step, Network & Targeting, is split into two parts. When adding a campaign you may select multiple networks. When you submit your campaigns, they are sent to each network individually. Yahoo Gemini has unique settings. If you select this network, Maximus will provide an additional final step where you can adjust Gemini settings. For additional information about targeting with different networks outside Maximus, click here. This is the unique name you give your campaign. 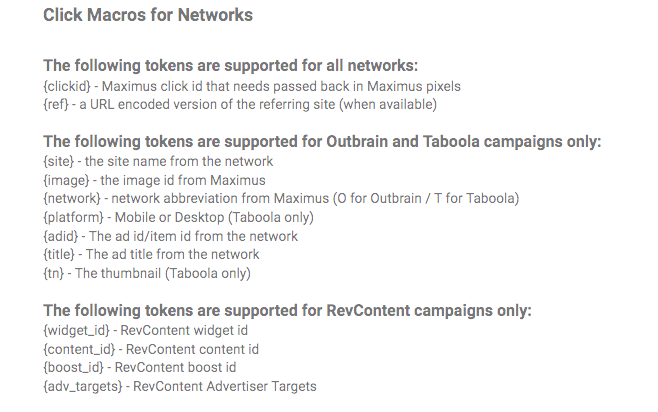 Maximus automatically prepends a network abbreviation to the beginning of the campaign name, and appends country targeting code and platform code to the name. Click here to learn more about Campaign Names. The Site Rule Set allows users to label whitelists or blacklists which they want to apply to the campaign. For Taboola, Site Rule Set is submitted as a comment on campaign submission and your network representative will apply that rule set when reviewing the campaign. For all other networks, site rule sets must be manually added. This field can be used to keep notes on the whitelists or blacklists you want to manually apply to your campaign. Select a start date for your campaign. This can be the current date, or a date in the future. Campaigns cannot be retroactively added. Select which country your campaign will target. You may select multiple countries. Choose a group for the campaign to be listed under. Only users who are a part of the specified group will be able to view the campaign in Maximus. This is optional, but helpful for large teams that have multiple users. Choose CPA (Cost Per Action) or CPC (Cost Per Click) tracking for your campaign. To learn more about how you can set up these campaigns, click here to read our CPA vs CPC documentation. Target desktop, phone, or tablet devices. You may select All, but it is not recommended to do so because the requirements for different platforms vary. For Taboola, you can select the OS you want to target. Click here to learn more about Taboola OS Targeting. For Taboola, you can select the Marketing Objective. Click here to learn more about Taboola Marketing Objective. For Taboola, Outbrain, and Gemini, users can add campaigns to a specific sub-account. This allows Maximus users to keep track of multiple clients on the platform. Once the campaign is created, it will be listed under that sub-account on the network. Gemini campaigns must select either Desktop, Phone, Tablet, or Phone + Tablet in order to use Fire & Forget™ optimizations. Once this information is entered, you will be able add your links in the second step. Follow the prompts under Link Setup to set landing pages and weighted links for your campaigns. Click here to learn more on the difference between the landing page and the weighted link. Tokens can be added to weighted links. Macro tokens act as tags that track different aspects or parameters of your campaign. Tokens from individual networks are passed dynamically and automatically to external tracking systems, and each network supports specific types of tokens. Click here for more information on macro tokens. Fire & Forget is split into two sub sections - Budget & CPC and Fire & Forget™. The daily budget for the campaign. The starting campaign CPC for the campaign. Fire & Forget™ optimizations allow for users to set goals and boundaries which Maximus will use to automatically scale campaigns based on performance. We recommend new users to watch the Fire & Forget™ Video Webinar. Click here to watch the video. Select a preset if you have one saved or create new preset settings. Click here to learn more about Fire & Forget™ presets. Enable or disable Fire & Forget auto-settings. This section is split into three sub sections - Campaigns, Sites and Day Parting. Maximus will start optimizing the campaign once the Sample Size amount is reached (before Sample Size is hit, Maximus pulls data on EPC and overall performance). Click here to see the Fire & Forget™ flowchart. The profit goal Maximus is working toward when scaling. The goal is related to CPC and EPC. As an example, if the Acceptable Profit is set at 22%, Maximus will set the CPC 22% below EPC to ensure you are hitting your profit goal. Click here to learn more about Acceptable Profit. When turned on, the Budget Reset feature automatically resets your campaign budget every day at 1:30 am EST. This prevents a campaign from spending outside of your budget. Click here to learn more about Budget Reset. This setting increases budget cap if a campaign is profitable and is close to reaching its set budget cap for the day. Click here to learn more about Budget Increase. The lowest CPC the campaign will drop to if it hits the Slow Amount. This is the lowest CPC bid you would want your campaign to reach. The highest CPC Maximus will use when attempting to reach goals. The amount a campaign can lose that day before Maximus moves the campaign level CPC down to the Lowest Bid. If site optimizations are enabled, all sites will be set to the Lowest Bid. If the campaign gets conversions and the profit loss improves it can exit Slow Amount. Click here to learn more about Slow Amount. If a campaign continues to spend after it hits your Slow Amount and hits your Stop Amount, the campaign will pause. If conversions come in (from a longer sales funnel, for example) and raise the campaign’s profitability out of the Stop Amount value, the campaign will automatically unpause and resume spending. Click here to learn more about Stop Amount. Fire & Forget™ uses look back days to determine how far back you will look for the Sample Size. Click here to read more about the Look Back Days. This time period is used for Acceptable Profit EPC calculations. The minimum number of clicks the campaign should reach before optimizations are performed. Click here to learn more about Sample Size. Desired Click Pacing works to get a specific number of clicks within a specified amount of time. Enabling this setting means Maximus will check that the campaign has met the desired amount of traffic within the window you set. 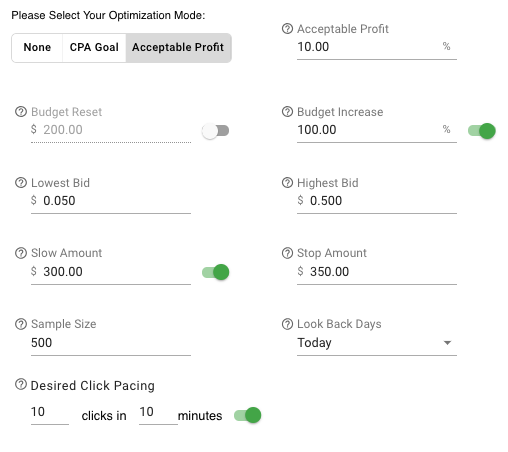 If a campaign is not meeting the Desired Click Pacing goal, Maximus will increase the campaign CPC by 10% until either Desired Click Pacing goal is met or the campaign CPC is at the Highest Bid. This setting can help users ensure that a campaign’s profitability doesn’t tail off. Click here to learn more about Desired Click Pacing. In addition to setting goals at the campaign level, Maximus also lets users set goals at a site level. This means Maximus can simultaneously optimize campaigns on two separate levels. CPA Goal does not have a Sites section. Site Acceptable Profit is the profit goal Maximus works toward at a site level. This uses the EPC from the Look Back Days period for caluclating the new CPC. Click here to learn more about Site Acceptable Profit. Set the number of clicks a site must have before Maximus starts optimizing the site. If it has not received this number of clicks within the Look Back Days, Maximus will not make any site bid optimizations. The floor is the absolute lowest CPC Maximus will bid at for an individual site. The cap is the absolute highest CPC Maximus will use for an individual site. This setting is only for Outbrain campaigns. It is the EPC value Maximus checks for before blocking a site. If a site has not yet reached the site Sample Size goal, Maximus will not perform this action. If you set the Site Block EPC value to $0.03, Maximus will block any site with an EPC of $0.03 or less that has met the Sample Size goal. Click here to learn more about Site Block EPC. For more information on Fire & Forget™ click here. Day Parting allows users to set a static bid and drive an increased or decreased amount of traffic during a set time period. These time periods can also be set to pause a campaign. Maximus does not honor Desired Click Pacing, Acceptable Profit, CPA Goal, and Site Bids during day parting. 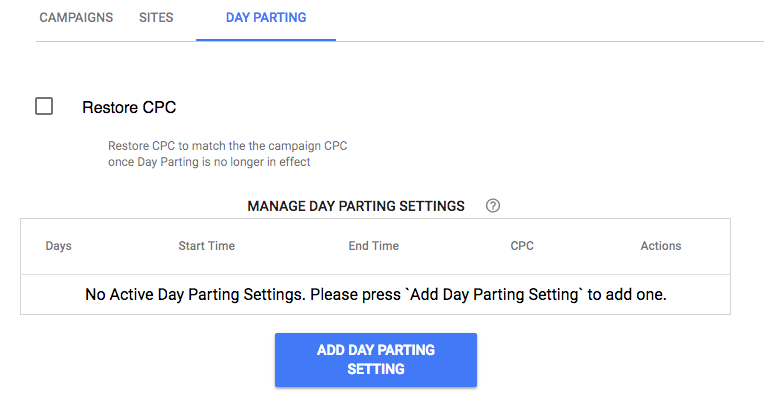 When this setting is enabled, Maximus will automatically reset the campaign CPC to your previously set value when a day part ends. This feature prevents Maximus from spending at a CPC that has been raised by other features such as Desired Click Pacing. Fire & Forget™ must be enabled in order to use Day Parting. Maximus has robust day parting features that allow you to specify day, start time, end time, CPC, and action. For example, if you notice a campaign performs poorly over the weekend, you can pause it or lower the CPC during that time to drive less traffic, protecting your budget. Click here for more information on Day Parting. Each network has their own guidelines and requirements for what is considered acceptable content. Click here to learn more about Network Rejection Reasons. The Ads section of adding a campaign is where images and text are added and uploaded for the campaign. This optional dropdown menu allows users to copy active images from other active campaigns into your new campaign. Campaigns that will display in the dropdown are active campaigns on the same network by the user. Branding text is the brand or company name that will be displayed with the campaign or ad. If you have errors when submitting the image and text for an ad, please check the text to make sure no special characters are present. A common example of this is using quotations marks copy and pasted from somewhere that formats them to curly quotes. If you have selected RevContent or Yahoo Gemini as your network of choice, you will need to enter some extra information into network-specific fields. The content type for the campaign. Select either Topic or Brand. The targeting type for your campaign represents the type of content hosted on your landing page. The options are App, Article, or Video. This is a user-friendly URL that will appear when the ad is shown on search for Gemini Ads. Multiple images may be added to Gemini campaigns to create a carousel ad. If you select this option, you will be able to add carousel images in the Gemini Settings section. To upload image files to the campaign, either drag images into the boxed gray area or click the area to open the file browser to select an image. Each network has unique guidelines and recommendations for images and ad text. If you are creating a campaign for multiple networks, adhere to the requirements of the network with the largest image size standards. Images will be sized down to fit other networks. Images will not be enlarged. Please see the chart below for image size and title length requirements by network. Maximus accepts most common image file types. *In addition to the 1200x627 rectangular image, Gemini also uses a 627x627px square image. This is because different images are shown when viewing the ad on mobile, tablet, and desktop platforms. After adding an image in Maximus your rectangular image must be cropped to the 627x627 square image. Upon submission of the ad, both versions of the image are sent to Gemini. **Gemini also offers the option to add Secondary Ad Text. Secondary Ad Text gives users the ability to split up a headline into two 30-character parts, effectively giving users 60 characters instead of 50 characters. When used in an ad, Ad Text and Secondary Ad Text are separated by a hyphen. Taboola also allows you to add animated gifs to your campaigns. Gifs must be over 400px x 200px, less than 3MB, and have a .gif extension. Ad Text Tokens are dynamic tokens that can be added to the ad text. These tokens allow for different ad text to display based on the user profile of the person viewing the ad. These tokens vary by network. Using Ad Text Tokens, you will be able to customize things like location (city, region, zip code, etc.) or day of the week in your ad text. For more information about how to insert ad text tokens, click here. For Taboola campaigns can select which Traffic Allocation you want to use. Click here to learn more about Taboola's Traffic Allocation. We recommend setting it to Even. If you run a campaign on Yahoo Gemini, this is the extra information you will need to include before your campaign goes live. The Gemini Settings are unique to Gemini and must be set separately. With age targeting, Gemini campaigns can be set to target specific age groups. Options are 18-24, 25-34, 35-44, 45-54, 55-64, 65+, or All. Multiple age groups can be selected. With gender targeting, Gemini campaigns can be set to target certain genders. Options are Male, Female, or All. 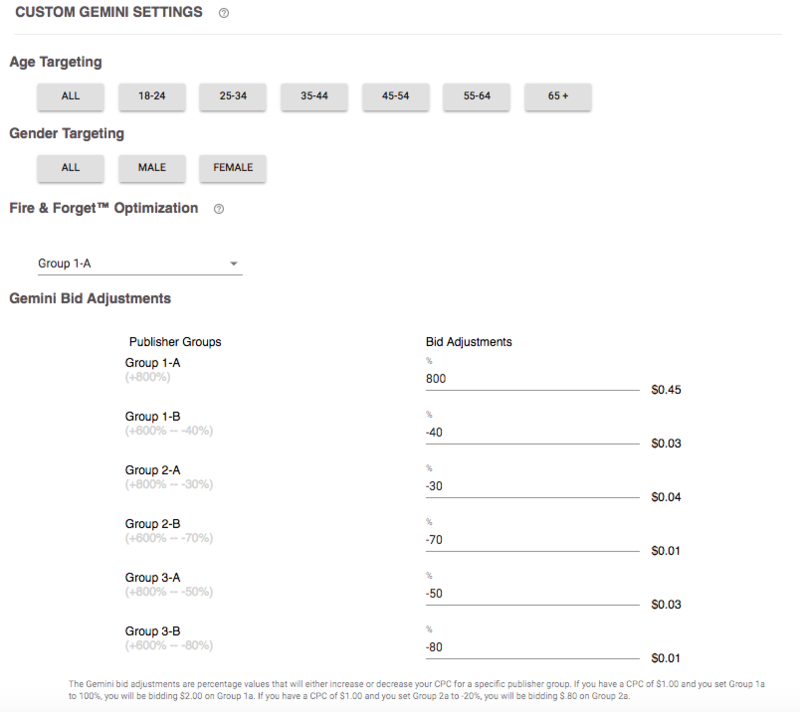 Maximus will adjust the bid modifier for the selected group when performing CPC optimizations. Group 1–A: Serves Yahoo sites and apps on large format devices. Group 1–B: Serves Yahoo sites and apps on small format devices. Group 2–A: Serves higher tier third party sites and apps on large format devices. Group 2–B: Serves higher tier third party sites and apps on small format devices. Group 3–A: Serves lower tier third party sites and apps on large format devices. Group 3–B: Serves lower tier third party sites and apps on small format devices. If 'Add Carousel Images' was selected in the content section, the images for the carousel ads are uploaded in this section. Click here for more information on carousel images.